"The story for the three new films (I-III) was meant to be the backstory of the other films (IV-VI). That backstory was sketched out in a rudimentary fashion when I wrote the first trilogy (IV-VI), and there were certain things I knew even then. I knew, for example, that there was a character named Anakin who grew up on a small planet, had special skills, and was found by the Jedi. I knew where everybody came from, who they were, and how they got to be what they were. A lot of the story points were there. But the actual scenes and many of the characters were not. "It takes me a long time to write screenplays. In writing Episode I, I spent a lot of the time doing research. I had to develop an entire world. I had to make a lot of decisions about things that would affect the next two movies, as well as this movie. Everything had to be laid out in this script so that the next two scripts would follow as they should. I also had to play this script against the three movies that had already been made, making sure everything was consistent and that I hadn't forgotten anything. There was a tremendous amount of minutiae in these movies that I had to consider. "In my original outline, I conceived of Anakin as a twelve year old boy. And there were a lot of things that would have been easier if he had stayed twelve. The casting would have been easier, for one thing; and it would have been easier to justify things like the Podrace or the way he is able to fly a starfighter at the end of the movie. "But the problem was that a twelve-year-old leaving his mother - as Anakin does - is not nearly as traumatic as a nine-year-old leaving his mother. And there is a key story point that revolves around the fact that he was separated from his mother at an early age, and how that has affected him. So I slid the age down as far as I could - but then I had the problem of him being able to race a Pod and fly the starfighter. Ultimately, it wasn't that hard to justify the Podrace. I set it up that he had done this kind of thing before; and there are nine-year-old kids who race go-carts, fly planes, and ride motorcycles - so it wasn't too farfetched. Having him pilot a spaceship was my main worry, and that was the thing I struggled with to make believable. I set it up that he is very bright, that he learns quickly, that he is already a pilot. I put in little scenes in which he is learning about the ship - a lot of that was interwoven throughout to make the ending work. I also had Artoo-Detoo in there with him, helping to fly the ship. All of these things helped; but making that ending credible was definitely one of the tougher issues. "Duality is one of the main themes of the film. There is duality in the character of the Queen, who trades places with one of her handmaidens, Padmé, as a decoy. Duality is also present in the characters of Obi-Wan and Qui-Gon. 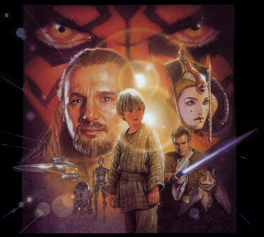 In the beginning, Obi-Wan is at odds with Qui-Gon, who rebels against the Jedi rules. But by the end of the film, he has become Qui-Gon by taking on his rebellious personality and his responsibilities. "Balance is another theme. The midi-chlorians have brought Anakin into being as 'the chosen one' who will balance the universe. The mystery around that theory is that we don't know yet whether the chosen one is a good or a bad person. He is to bring balance to the Force; but at this point, we don't know what side of the Force needs to be balanced out. "The overriding philosophy in Episode I - and in all the Star Wars movies, for that matter - is the balance between good and evil. But it's also a balance of many characters and many stories. And each subsequent Star Wars movie had more characters and stories than the previous one. Writing a story is very practical - in order to construct scenes, you need to have interaction, people talking to one another, otherwise you wouldn't have drama. Anakin needed to have a mother, Obi-Wan needed a Master, Darth Sidious needed an apprentice. Everyone has to have somebody who influences them. 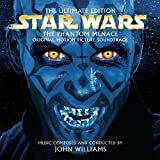 "The basic story underlying all the others is how Senator Palpatine becomes chancellor of the Republic. Everything else revolves around that story line. "The second plot is about the Trade Federation trying to gain control over an out-of-the-way planet ruled by a young Queen, and how that Queen repulses the invaders. 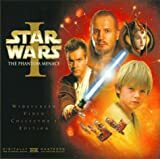 That story line precipiates the third, which is the chancellor sending Jedi Knights to try and negotiate peace, and the way in which those Knights get intertwined in the political arena of this invasion. We are introduced to Qui-Gon, who is very independent, always testing the rules. And we meet young Obi-Wan, who is constantly frustrated by his Master's refusal to go along with the program. "The fourth story line involves young Anakin Skywalker and how he becomes a Jedi. That leads to the fifth story point, which deals with the rise of the Sith Lords, and the Jedi concerns about the fact that they've been resurrected after a thousand years." "and he shall be known as the Son of the Suns"